Hello, stamping friend, and welcome to the November edition of the Blogging Friends Blog Hop! As you may recall, each month we choose a ‘theme’ for our hop, and this month we decided to honour one of Stampin’ Up!’s longest-running stamps in production – Lovely As A Tree! (of course, not everyone may have this in their stash – I know, right?! 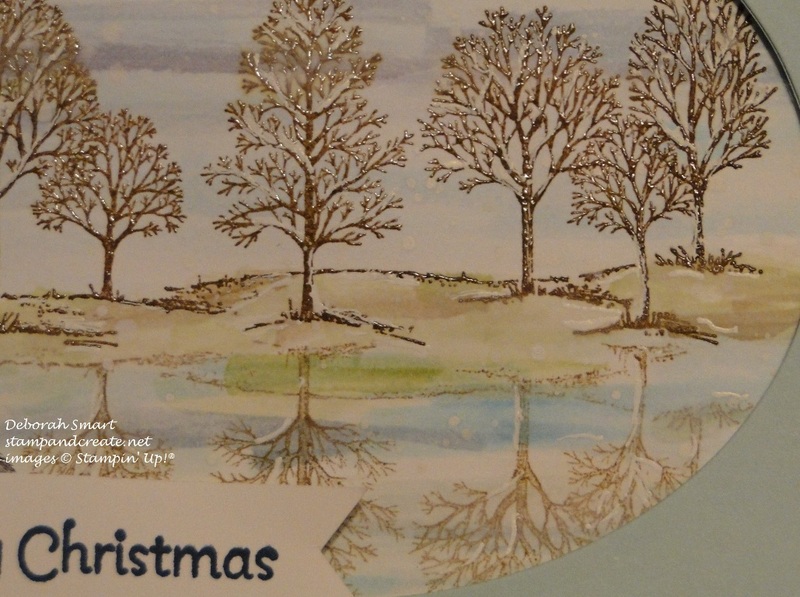 – so we are also incorporating any tree themed stamp sets). In case you haven’t ‘hopped’ with the Blogging Friends before, and are wondering what it’s all about – that’s easy! We are a group of demonstrators from different parts of the world, who like to share our love of stamping and paper crafting with you. So, we get together – virtually – each month, and create this blog hop for your enjoyment and inspiration. To view all of the projects, all you have to do, dear stamping friend, is simply click on the ‘Continue’ button found at the bottom of each post, and you’ll be taken directly to the next blog in line. We do know that technical gremlins do like to mess things up once in awhile, so you can find a list of the participating blogs and their links on almost every post, as well. Okay – enough with the small talk – let’s get on with the projects! If the links have all been working, you’ll have arrived to my post from the talented Danica Ferrante; weren’t here projects great?! Lately, I’ve been having fun getting inky, and creating backgrounds with various effects. For this card, I took my panel of Whisper White cardstock, and masked off a portion of the panel using Post-it Notes. Then, I took my Sponge Daubers and blended Cajun Craze and So Saffron ink within the panel. Leaving the Post-it Notes in place, I inked up the leaves image from Lovely As A Tree in Versamark ink, and stamped them on top of the sponged area. 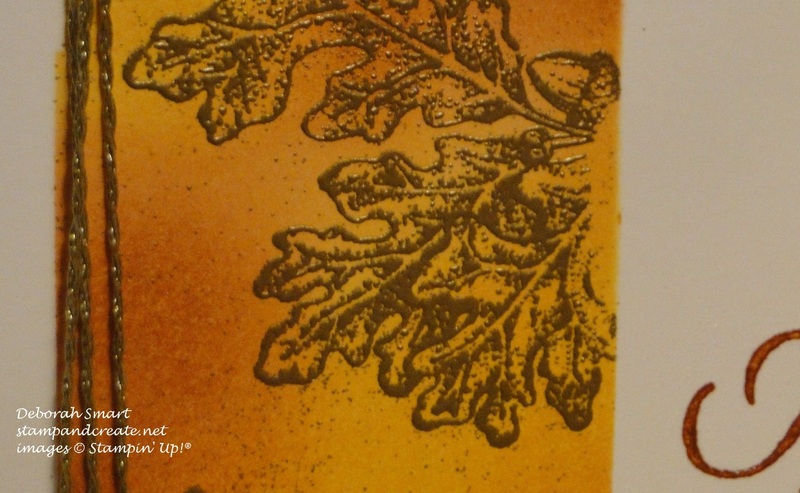 I covered the leaves in Gold Embossing Powder, and set it with my Heat Tool. After that was done, I removed the Post-it Notes to reveal my panel. I wanted to keep the focus on the sponged area, so I chose the simple sentiment from the Wetlands stamp set. I inked it first in Versamark ink, then immediately afterward in Cajun Craze ink, then covered it with Clear Embossing Powder. Using the Heat Tool to set the powder, and it was done – heat embossing in a colour for which we don’t have the embossing powder! TIP: This can be done with any of our inks – as long as you first ink your stamp in Versamark, then directly in the coloured ink and heat set with Clear Embossing Powder, it will appear as if you used coloured powder. To finish off the front, I wrapped the Gold Baker’s Twine from the Baker’s Twine Trio Pack, 3 times around the left side, and tied it off with a small bow. I then attached my card front to a panel of Cajun Craze cardstock, then to the card base of Delightful Dijon cardstock. I really love the depth and warmth of these fall colours, don’t you? For this card, I chose a softer look, and used the Reflection technique. I started with a panel of Whisper White cardstock. I wanted to do a watercolour wash for the sky and water, so I needed to heat emboss my trees. I inked up the stamp first in Versamark ink, then Soft Suede ink, and heat embossed with Clear Embossing Powder. To create the reflection, I inked the stamp in Soft Suede ink and stamped directly onto a piece of Window Sheet. I then turned the Window Sheet over, and upside down, and pressed it in place under the stamped trees. I rubbed my fingers over the stamping on the Window Sheet to transfer the ink to the cardstock, then removed the Window Sheet. Voila – reflection! To create the sky and water, I used my Aqua Painter brush and inks in Soft Sky, Dapper Denim and Pacific Point. I used the Aqua Painter brush with Old Olive and Soft Suede inks to create the ground. I decided to make the scene with a light snowfall, so I mixed some water with the Craft White reinker, and used an paintbrush to splatter some drops of white – they’re a bit hard to see! I then used my Signo White Gel pen to add some snow build up in the branches and on the ground; again, it’s very subtle, but it’s meant to be a light snowfall. I used my retired Ovals Framelits to create an opening in a panel of Soft Sky cardstock, and layered it on top of my stamped panel, using Stampin’ Dimensionals. I then added that to my card base of Dapper Denim cardstock. I used the sentiment from the (long) retired More Merry Messages stamp set, inked in Dapper Denim, and stamped onto a piece of Whisper White cardstock. I used my Paper Snips to create banner tails on one end, and attached it to the card front with Stampin’ Dimensionals. 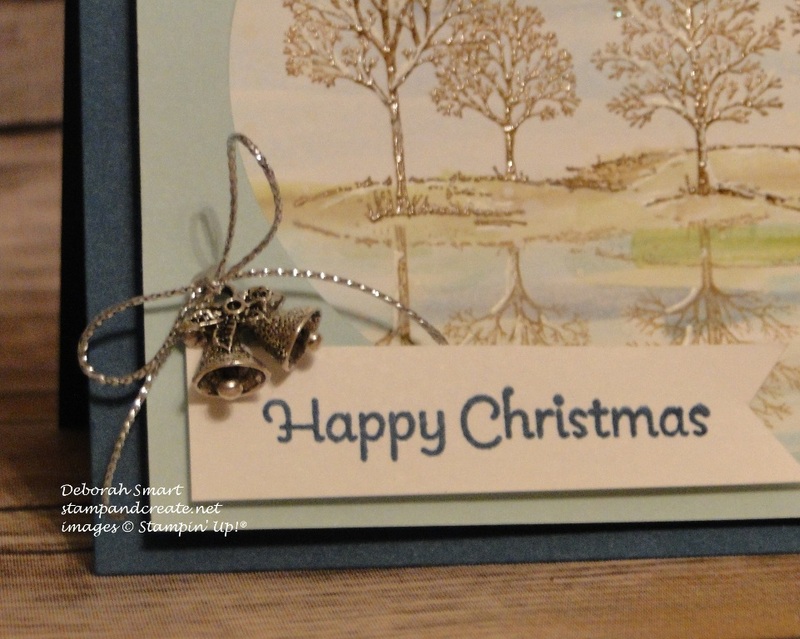 To finish off the card, I added one of the Bells from the Christmas Trinkets Embellishments, and used the retired Silver Cording to add a bow on top. I just love the terrific new embellishments we have in the Holiday catalogue – they’re perfect for the finishing touches for your projects! I hope you enjoyed my projects for this Blog Hop – I’d love to read any comments you’d care to leave, before you head over to the next blog. All you need to do now is click on the ‘Continue’ button to go directly to see what Jessica Mink has created for you! Of course, if you don’t already have your own demonstrator, and would like to order any of the products used to create the cards, just click on the images below to place your order with me. Thanks for spending time with the Blogging Friends today! Inspiring projects- thanks for sharing. I have a couple ideas to go try just from looking at your cards. Deborah these are just gorgeous, the sponging and embossing are so fabulous I love the clean elegance of that first card. The next one is so impressive that reflection is spot on such a great job. These cards a beautiful, Deborah! I love the embossed oak leaves and the watercolour background. 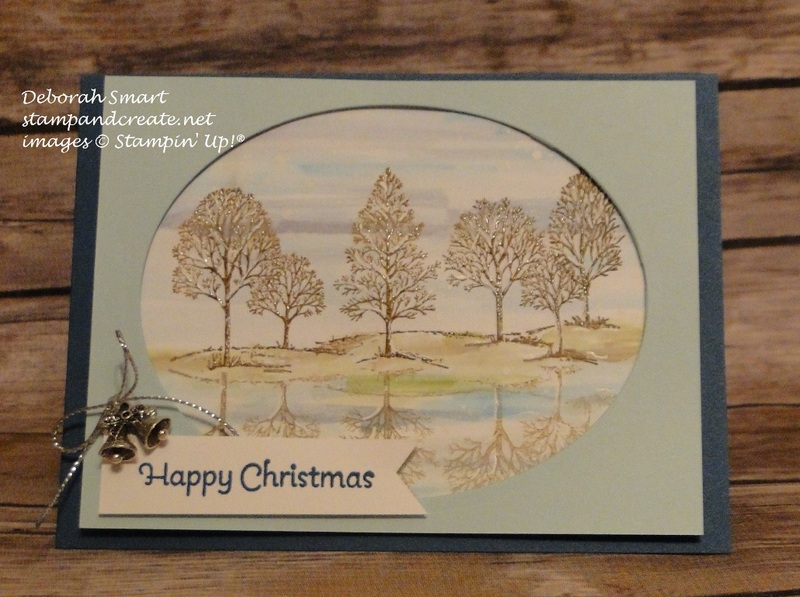 I love the soft colours and framed trees on your second card. Really beautiful. Thanks for sharing. Love them both! So hard to choose but the first one is one I must case! TFS! I think the reflection technique using Lovely As A Tree is something I’ve taught all my classes, Crystal; it’s sort of a ‘tradition’ with such a classic stamp set 🙂 When I was tying on the bells, I got the Christmas Carol ‘Silver Bells’ stuck in my head for the rest of the day! Wow! Great projects, but I especially love that Christmas card — it’s stunning! Thanks Anna! I love the classic reflection technique; it always seems so calming. Such great projects! I love how veristale this set is and all the occasions you can use it for. I have always wanted to try the reflection technique…yours turned out Beautiful!